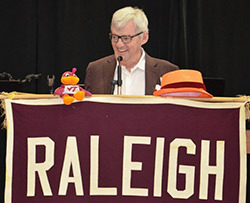 The Raleigh Sports Club is in its 55th year of providing weekly luncheons where 150 or more gather each week to hear fascinating stories from riveting speakers representing all parts of the college and professional athletic scene. 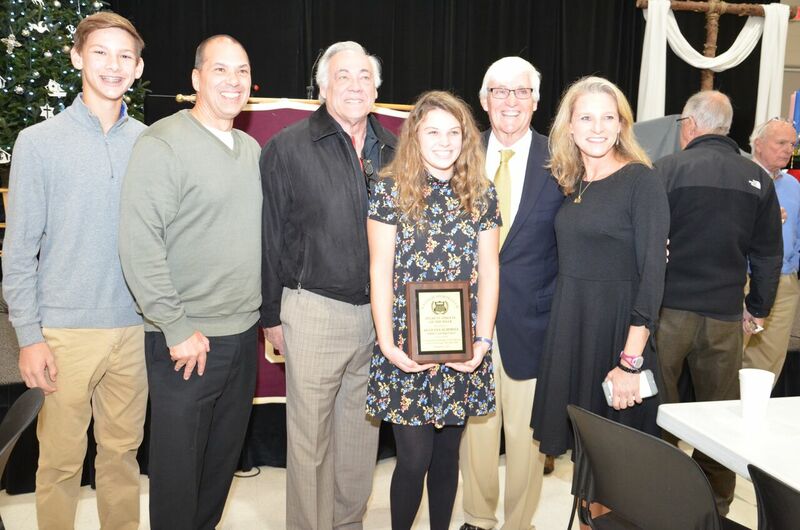 The Club also recognizes an outstanding high school student-athlete each week, enjoys camaraderie with sports minded friends, partakes of a delicious buffet lunch, tests skills at picking winners of weekly sporting events, and occasionally goes home with a free meal voucher or door prize. Established in 1964 with 12 charter members, the Club has grown to fill Bradley Hall at Highland United Methodist Church, 1901 Ridge Road. At the Raleigh Sports Club we introduce members to a wide and very impressive variety of speakers to our weekly meetings. On any given week, you could hear from Frank Beamer, the Hall of Fame former football coach of the Virginia Tech Hokies (shown above), the head coach of an NCAA champion basketball team, a professional referee, or the receiver who became famous for making the winning catch. The RSC honors local high school student athletes for their achievements on the field, in the classroom and in the community. The RSC has a wonderful southern style buffet. Long lines form to get some of the best food and hear some of the most prominent sports speakers in the country. Get there early to get a good seat. 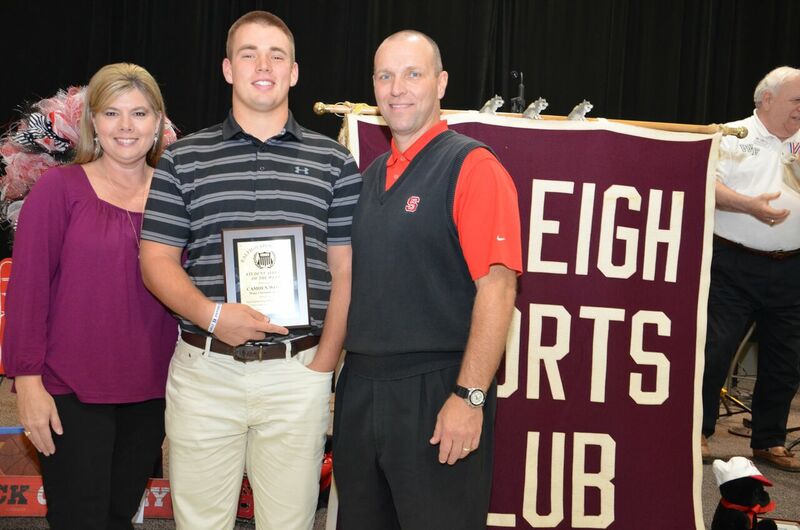 For many years Mort's of Raleigh, NC has been donating the custom engraved plaque that is presented to the Student-Athlete who is honored each week by the Raleigh Sports Club. We appreciate Mort's gracious contributions to recognizing the amazing achievements of our local high school youth. Our meetings are held in Bradley Hall inside Highland Church, 1901 Ridge Road at the intersection of Lake Boone Trail, just inside the Raleigh Beltline. Buffet lines open at 11:30am and the meeting runs from Noon until 1:00pm on Wednesdays. Meetings are typically held every week (except Thanksgiving, Christmas and New Year's holidays) from early September through late March. The Club's season ending banquet was held on Wednesday evening, April 3 with more than 160 in attendance. We enjoyed a Social Hour and delicious dinner followed by the introduction of the four Student-Athlete winners of a $2000 college scholarship each along with a beautifully framed certificate. Next to be introduced was the Raleigh Sports Club High School Coach of the Year who received a certificate and a check for $1000. Finally, we were treated to wit and wisdom from our keynote speaker, Eddie Biedenbach, a member of the NC Sports Hall of Fame. Eddie was an All ACC basketball guard for NC State and later an assistant coach on the 1974 national championship Wolfpack team. 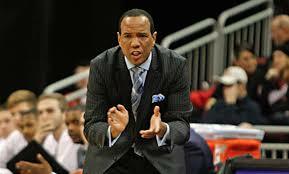 Eddie's 40 year coaching career has provided wonderful insights and amazing experiences that have built his reputation as a terrific story teller. President Carol Pope closed the banquet with wishes to everyone for a wonderful summer and the invitation to meet back again for lunch and a new program that will begin our new season on Wednesday, September 4. Design by Page Progressive - print and web design in Raleigh, NC.